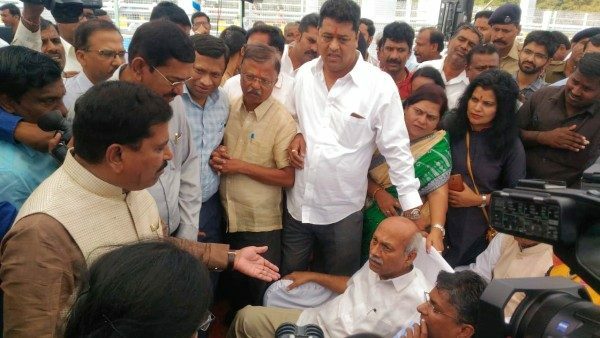 We are all used to see the MP’s fight it out verbally in the parliament but the citizens of Belagavi were lucky to see similar verbal clash this time of the same party during the inauguration of the Gogte Circle Road Over Bridge. Rajya Sabha MP Prabhakar kore was upset with MP Suresh Angadi has his name was missing from the invitation and also the backdrop on the stage even when the project was implemented by the union Govt. After seeing his name missing from the back drop Kore said he wont come on the dais and also asked Angadi if it was his private program and not that of the Railways. Angadi addressed Kore in singular asking him to come to the dais and stop arguing. Angadi said, Stop this nonsense and keep your aside and you should listen to me. Angadi said you are a senior leader and you must not act like this. Lastly, Angadi pulled Kore’s hand and almost dragged him to the stage where both the MP’s were seen red faced. Later speaking Kore said that This road over bridge should be given the name of Suresh Angadi, and jokingly said not in memory but. It must be recollected that the MP’s have attempted to take credit of the passport office, the UDAN scheme, upgradation of airport etc. High drama during inauguration of the Gogte circle Road over bridge. Where Prabhakar Kore and Suresh Angadi had a verbal clash over Kore’s name missing on the banner on stage. Classic case of Maslows Theory..